About Snakes: Most TX snakes are not venomous. However, if you are ever unsure about the species of snake that you see, you should leave it alone. 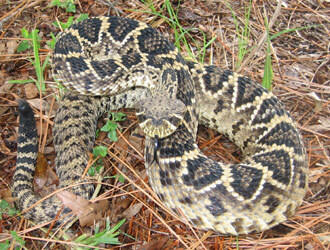 Texas does host several species of venomous snakes. Most bites occur when people try to catch or handle these reptiles. We are experts at snake control and removal from private homes and properties. We excel at both Arlington snake trapping and prevention. We are not a snake exterminator company, but we use techniques such as humane live trapping, prevention, and exclusion to solve your Arlington / Fort Worth snake problem permanently. We boast a 98% success rate, the highest in the industry, and are voted the Arlington / Fort Worth area's top wildlife animal control company. Give us a call at 817-717-3606 and we will take care of your snake issue for good. About Us: All Animal Control in Arlington and Fort Worth TX is a full-service, licensed and insured nuisance wildlife control company. We solve conflicts between people and Texas' wildlife. We are considered the best wildlife control company in the Dallas area, and our rates are not only competitive, but well below the average for the area. We are a small, owner-operated company, and we don't have the overhead of the big companies. Also, unlike the larger companies, we do our own work (not some underpaid and careless employee) and we take great pride in our work. Give us a call to discuss your Arlington snake removal project, and we will give you a price quote on the phone, and schedule a same-day or next day appointment at your convenience. Hi David, I wanted to know if the black racer snake and the garter snake are dangerous in any way ?? I would really appreciate any information you can give me about them !! my problem is I have a couple garter snakes living in the brickwork in my home they come and go through a small hole in the bricks only a small part of my house has bricks !! One is a big brown garter " I think" and it has babies and it is aggressive if I try to go near part of the house and the other one is black and comes and goes through the hole also, I've even seen another brown one that is a different size.. They were here last year also and had babies then too !! I'm scared of snakes and wish to get them to move somewhere else is there any way I can do that !! do you have any suggestions that may help me ? Also are they going to live here forever ?? What if I cement the hole in ??? I'm afraid that might cause them to come in the basement !!! What do you think ??? Thank you for answering my questions and being very helpful !! I have encountered twice a black snake, one in my garage and one in the back yard. I did call the animal control the first time but when I described it (all black) they just told me to open the garage door up and it will follow the sunlight. While waiting I did see it underneath the shelves and finally went out although I didn't see it go out (phone rang in house). When I came back out it was not there. Now today I was pulling weed and saw another black snake - not sure if it is the same one or a sib. Went to your website because I wanted to make sure it was not a moccasin snake and thanks to your site it was the best picture I could compare it to. So grateful it was not but I am concern I may have a big active pile of snake some where on my property. Any one you recommend in the Tarrant County area to check this out? Thank you! David; I live alone in Fort Worth Texas except for a dog and cat. The cat brought in a snake about 12 to 14 inches in length. It was off white in color and very thin, about 1 inch round. It was marked with grey/ black strips. When I seen it , it was in a circle and I believe dead. I touched it with a broom and it never moved so I swiped it into a dust pan and threw it outside. What type of snake would you guess it was? My cat is still alive. I have a water pan near where my cat picked it up. Did the water draw it inside the walk in kennel attached to the house? David, should I be concerned that now I will have snakes here? I am 77 years old and scared of snakes but someone had to get it out of the house. Since I am the only one here it was me. I am interested in what type of snake you think it is. ps; My neighbors and I have never seen a snake here before. My cat brought me a present two nights ago. A snake. My neighbors or myself have never seen snakes here before. Lucky for me (who lives all alone) the snake was dead by the time I seen him. Could you tell me what type of snake this might be? The snake was about 12 to 14 inches long and about 1 inch in diameter. The color was dull white with grey/black strips. Now that I have read your blog I’m feeling pretty brave. I live alone so who else to sweep the snake up and throw him outside? Does your Fort Worth snake removal company do this? I have water near where the cat picked him up, do you think the water drew him to the house? Visit the Arlington Wildlife Control home page or the Tarrant County Animal Control page for more information.